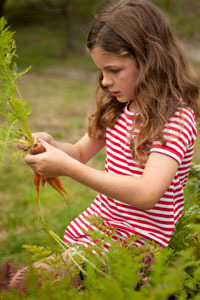 Grow Your Own - Because you'll now be eating lots of fresh vegetables, give some thought to actually growing your own organic lovelies. This way you'll know exactly where your food comes from. It doesn't matter whether you live on acreage, on an average suburban block, or an apartment with a small balcony. Where there is a will, there is a way. All it takes is a bit of dirt, sunlight, a seed and water to get you started. Why not get your kids involved too? If they grow them, you might find that they may actually want to eat them :) This quote may inspire you .. "Growing your own food is like printing your own money!" Don't stop at just your veggies, how about your own regular egg production with some chooks? They'll help eat any scraps you may have and provide you with some top-notch fertiliser for your veggies too. Buy Organic - This way, in Australia at least, you can be guaranteed your food contains no Genetically Modified Organisms (GMO's) and/or chemicals. By buying organic you are actually encouraging more farmers to grow organic food and that's got to be a big win for Mother Earth as well as our own health. Even if you can only afford to buy a few items a week, it's better than nothing. Don't be afraid to ask the question either. While some farms aren't actually "certified" organic you may be comfortable knowing that the farm your food comes from is actually chemical-free. The chicken I buy from my local butcher comes from a local chemical-free, free-range farm, and I'm happy with that. It can cost big bucks for that organic certificate and not every farmer can afford it. Shop Local - Visit your local farmer, farm-gate or farmer's market. Get to know your farmer and his farming practices. Are his chickens free-range? Are his cows pasture-fed? Does he use chemical spray to control pests? 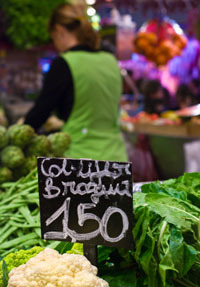 Help support a small business owner by shopping at your local butcher, whole foods, health foods, deli or green grocer. These guys are the back-bone of this country and they too have families to feed. Avoid The Aisles - If you do have to shop at the supermarket, you'll find 99% of the items you need are on the outskirts of the shop anyway. Avoid the aisles like the plague if you can. It's here you'll find your box of Type 2 Diabetes, your packets of High Blood Pressure, a carton of Obesity, along with many other containers full of food-related Cancers. And while there are times when a visit down an aisle can't be avoided for items such as toilet paper, they are brief and can last mere seconds if you practice.